Some spread betting brokers also allow contingent orders. As the name suggests, these orders only happen if some other condition is satisfied. One example of this would be if you placed a limit order to enter a trade at a certain level. If you have a specific target entry price level in mind you could set a stop or a limit order to open. This would trigger only if the market hit the specified level. A contingent ‘if done’ order goes one step further by linking a stop loss order and a limit to take profits. You could in this respect place a contingent order to set a stop loss, contingent on the trade having been opened – after all, you do not want to “sell to close” a position if the trade has not been opened yet. Contingent orders will let you to set up the whole pattern of a trade in advance, including a stop loss order and a take profit order, allowing you to get on with other things while the markets are open. The way a contingent spread betting order works is that if the original opening order is triggered, a limit order to close out the spread bet at a gain and a stop to close the trade at a loss are also activated. Futures traders have used this type of order combination extensively for many years but it is now supported on a number of spread betting provider platforms. Provider’s June Wall Street quote is 11,352 – 11,358. 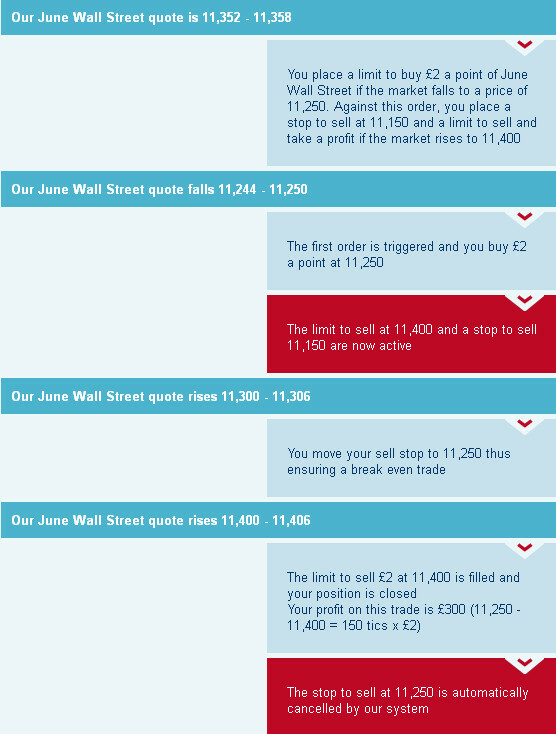 You place a limit to buy £2 a point of June Wall Street if the market falls to a price of 11,250. Against this order, you place a stop to sell at 11,150 and a limit to sell and take a profit if the market rises to 11,400. Provider’s June Wall Street quote falls 11,244 – 11,250. The first order is triggered and you buy £2 a point at 11,250. The limit to sell at 11,400 and a stop to sell 11,150 are now active. Provider’s June Wall Street quote rises 11,300 – 11,306. You move your sell stop to 11,250 thus ensuring a break even trade. Our June Wall Street quote rises 11,400 – 11,406. The limit to sell £2 at 11,400 is filled and your position is closed. Your profit on this trade is £300 (11,250 – 11,400 = 150 tics x £2). The stop to sell at 11,250 is automatically cancelled by the spread betting provider’s platform. One-cancels-other orders consist of two orders that are attached to each other. If either of the orders are executed because market conditions have been met, the related order is automatically cancelled. A simple OCO is usually where a client places both an attached limit and stop to a trade. Now not all these types of order are available from every broker. Whether you need them may depend on what type of strategy and trading plan you intend using. If you have a particular requirement, make sure that the broker you choose supports it, and then practice with the demo account to make sure you understand how to set the different levels.